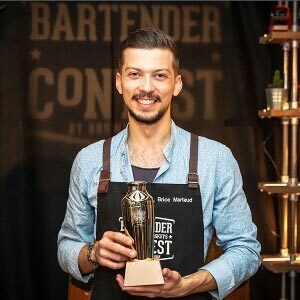 The unprecedented final took place in Paris on 24 July at La Menuiserie, where Brice Martaud (Bar Le Dandy in Lille) stood out among seven highly experienced French barmen. The evening of the competition was orchestrated by Nir Chouchana, American Whiskeys instructor for Brown-Forman and master of ceremony for American Whiskeys Contest 2018. This year’s semi-final featured eight bartenders from all over France, and only four made it to the final round: Ben Tyler (La Mezcaleria in Paris), Benoit Guerin (Le Santeuil in Nantes), Fred Chantepie (Kit Kat Bar in Nantes) and of course Brice Martaud. To win the jackpot, the four bartenders faced off in the final stage where the judges tested creativity, aesthetics, originality and presentation technique. Sunday Mood was the cocktail for the victory of Brice Martaud, a reinvented Manhattan. You will have the opportunity to discover Jack Daniel’s distillery in Lynchburg, Tennessee and Woodford Reserve distillery in Versailles, Kentucky.